Spider-man 4 Out, Spider-man Reboot In!!! After months and even years of deliberation. 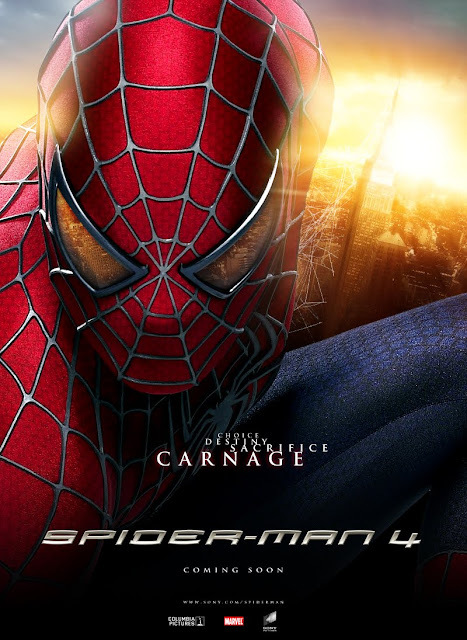 Columbia Pictures, Sony Pictures and Marvel Studios announced that Spider-man 4 is scrapped. But stop there is more, despite the cancellation of Spider-man 4, production studio will still move forward, and yes you guess it right. Spider-man reboot you are in. It seems that the poster above will never see the light of morning again for Marvel Studios together with Columbia Pictures and Sony Pictures decided to carry on to another path by doing a completely rebooted saga of our friendly neighborhood based on the script by James Vanderbilt that focuses on a teenager grappling with both contemporary human problems and amazing super-human crises. Other than a new script, the whole movie will also utilize not only a new production team but also a new cast. With this development, new Spider-man film will be pushed to 2012 release date together with the Avengers Movie. Good because I believe the trilogy is going nowhere with Spider-man 3 and reboot is really a good start for a fresh idea. Bad, because I can't imagine other actors playing Peter Parker and I think Tobey had already earned being Spidey and Peter Parker himself. Hope to hear more about this new development. i hated the direction that spider-man (the franchise) was going. but i feel tobey maguire played a good peter parker. sad to see him go. @laszlo IKR. Now I'm curious who will take the mantle of Spider-man.